The chassis is a unique hybrid design with a galvanised, powder coated deep drawn pressed steel cutting chamber with a J section lip for increased stiffness and the rigidity of a cast aluminium conveyor at the rear of the machine, incorporating the lower handlebar mountings. The conveyor is the perfect shape to maximise air flow, which is further enhanced by fins moulded into the anti-scalp plate at the front of the mower. The Twinclip 55 SH BBC boasts new cutting technology – a double layered blade with 4 cutting faces. The leading edge of the blade makes the initial cut; the second blade cuts an additional 19mm, the cuttings are cut and re-cut through the blades as they are blown into the large 70 litre collector, resulting in noticeable collecting performance of around 20%. The cutting height is selected by a single lever on the chassis, with a choice of 7 positions ranging from 25 to 77mm, that will produce a great finish on your lawn whatever the conditions. If the grass is longer, remove the collector and rear discharge or simply insert the mulching plug and drive in Multiclip mode. The Twinclip 55 SH BBC comes complete with a mulching kit facility and is supported by a 5 year manufacturer's warranty. 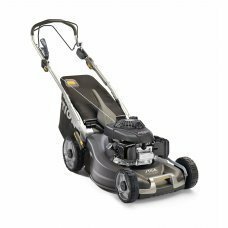 The 53cm/21" cutting width makes this great mower suitable for moderate size gardens up 50m x 50m.